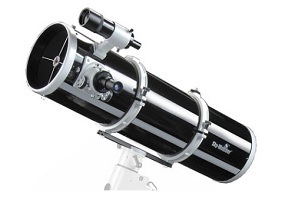 The SkyWatcher Explorer 200P has a black paint job with sparkles in with white fittings and rings which is very effective. I use this scope with my EQ5 GOTO mount it stands a little high but the tube can easily be turned to suit the viewer. Included is a 9x50 finder scope, 25mm and 10mm eyepieces and a 2x Barlow. The focuser is 2” with a 2” to 1.25” adaptor supplied both the Barlow and 2” adaptor will accept a DSLR camera adaptor for Astro imaging. Planetary viewing is impressive with crystal clear views of Jupiter and Saturn, viewing some of the brighter deepsky objects are also very clear with using the x2 Barlow and 10mm eyepiece. I have double stacked x2 Barlows in the focuser of this scope to push the magnification to x600+ and still achieved good images with longer exposures (with a guided mount). The 200P has a vented mirror so it is easy to cool to remove the boundary layer which will help produce clearer images. The overall look and feel of the scope is good and i would recommend this to any mid level astronomer or a beginner that has a little extra cash to spend.